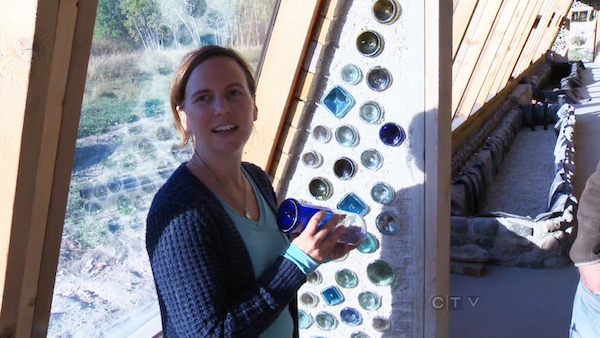 The future Earthship residents Kris Plantz and Nicole Bennett, along with a group of enthusiastic volunteer helpers, have been busy constructing the first Earthship home in Manitoba, Canada for over a year. Their future off-the-grid, eco-friendly home will be made from mainly earth, concrete and recycled materials such as old tires, pop cans and glass bottles. Kris and Nicole bought the plans for their house from Earthship Biotecture of Taos, NM for $9,000, though they needed to also obtain all the necessary geotechnical and structural engineering stamps before construction could begin. In addition to that, they also needed to obtain a geotechnical permit for he recycled-tire retaining wall that supports a large earth berm on three sides of their Earthship house. Once all the permits and other legal documentation were secured, the couple began construction by first collecting old tires and pounding them full of earth. For this purpose, they used a natural mixture of rock, sand and clay that was excavated from a pit dug roughly 100 yards from the building site, since topsoil should never be used for this step in the Earthship construction process. Most of the tires needed were obtained from local landfills. During this process, each tire was filled with earth and all the loose material pounded or rammed firmly into the side walls using a sledgehammer. These filled tires were then stacked in alternate courses like bricks to the suitable height. As the wall rises, every new row of tires needs to be set back 1.5 inches from the previous row to ensure that the finished wall leans on the earth berm that covers the tires and slopes back 40 feet from the north side of the building. The wall was then filled-in with thousands of recycled tin cans and glass bottles. The foundation of the house is also made up of earth-filled tires, followed by10 inches of clean, compacted gravel and covered with a layer of rigid foam, a grid of rebar and a thick layer of concrete. 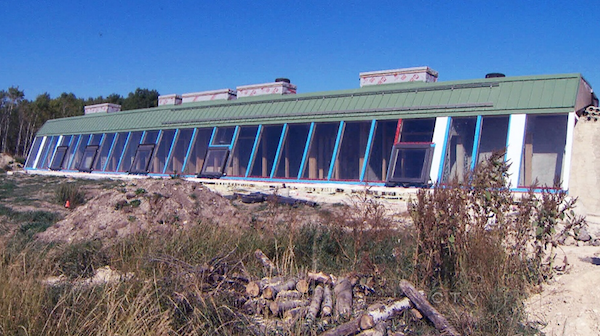 Since the Earthship home is designed to be a heat sink, the concrete floor will either be left bare or finished with ceramic tiles. Solar panels will be mounted on the south-facing wall to generate the needed direct current (DC) electricity, which will be needed to power the lights, fridge, and water pumps, as well as a propane-powered stove. The house will also be fitted with two 1300-gallon cisterns under the berm, which will be used to collect snowmelt and rainwater to take care of the household water needs. The house itself is divided into two sections. The first is a long hallway with a south-facing exterior wall built of double-pane windows. This section has two deep and narrow trenches dug into the floor near the interior side of the windows, which are connected by below-level pipes. This is the so-called greenhouse of the home and represents an integral part of the building design. The trenches contain rock, sand and topsoil where plants adapted to warm, moist environments can grow. These plants can be a source of food, while the troughs also represent a water-purification system. 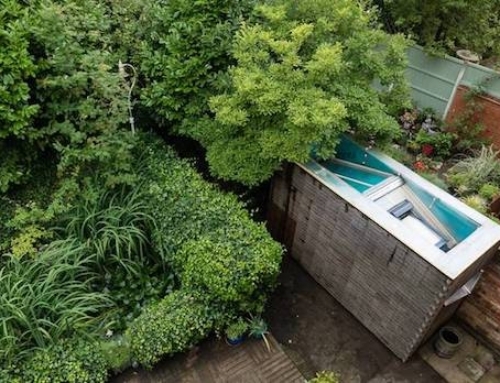 Grey water from sinks and showers flows into the pipes, watering the plants and is then purified to be reused for such purposes as flushing toilets. The greenhouse also acts as an integral part of the Earthship’s solar heat/thermal mass collection system, which is regulated by ceiling vents that can be opened or closed to control the interior temperature. This Earthship is the first one built in an extreme northern climate, so heating concerns are paramount, and the couple estimates that the indoor temperatures will not fall below 8 degrees Celsius in the winter. The home was also fitted with standard electric AC-baseboard heaters to help regulate the indoor temperature. 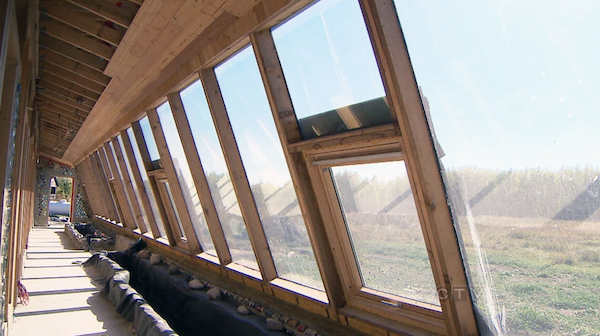 The main living area, which represents the second section of the house, is separated from the greenhouse by glass walls that will work to transfer solar radiation into the rooms, and thus aid in the heating of the home. The house cost $200,000 to build, but the owners estimate that the upkeep will not exceed $10,000 once they move in. they also hope that their example will inspire others to build their own Earthship home. Very cool. I hope it works out for them.